A new near-complete fossilized skeleton is thought to represent the first Jurassic ichthyosaur found in India, according to a study published October 25, 2017 in the open-access journal PLOS ONE by Guntupalli Prasad from the University of Delhi, India, and colleagues. Ichthyosaurs, literally 'fish lizards' in Greek, were large marine reptiles which lived alongside dinosaurs in the Mesozoic Era. While many ichthyosaur fossils have been found in North American and Europe, in the Southern Hemisphere, their fossil record has mostly been limited to South America and Australia. 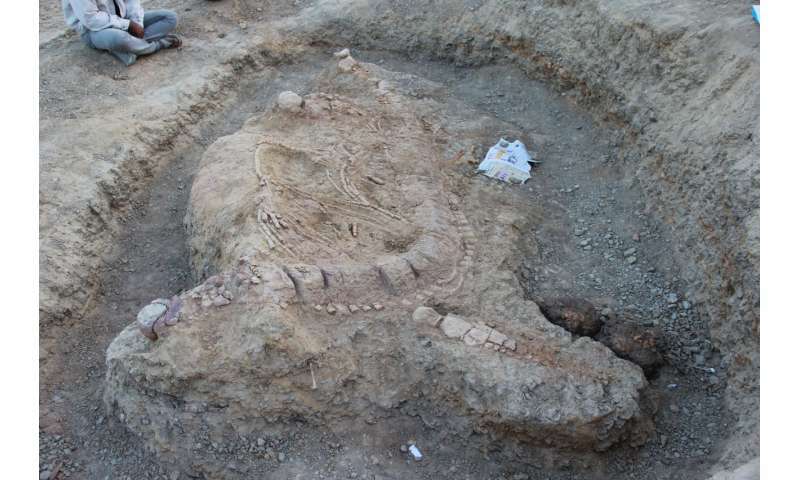 Now, the authors of the present study report what they believe to be the first Jurassic ichthyosaur found in India, from the Kachchh area in Gujarat. The near-complete skeleton, nearly 5.5m long, is thought to belong to the Ophthalmosauridae family, which likely lived between around 165 and 90 million years ago. It was found among fossils of ammonites and squid-like belemnites, and its tooth wear patterns suggest it predated such hard, abrasive animals. While the authors have not yet been able to pinpoint the ichthyosaur's species, they believe that a full identification could inform on possible ophthalmosaurid dispersal between India and South America. They hope that unearthing more Jurassic vertebrates in this region could provide further insights into the evolution of marine reptiles in this part of the globe. Lead author Guntupalli Prasad notes: "This is a remarkable discovery not only because it is the first Jurassic ichthyosaur record from India, but also it throws light on the evolution and diversity of ichthyosaurs in the Indo-Madagascan region of the former Gondwanaland and India's biological connectivity with other continents in the Jurassic."